If you tried to follow the instruction inside of the blog in a paid SAP account mostly you could successfully run you application and see the list of one of the NorthWind’s set. The only problem that maybe you suffered is that, inside of the that post it has been said to use /V3/northwind/northwind.svc as the service URL while as soon as you try to test the NorthWind with that URL you will see an error that says OData version 3 is not supported. This problem can be easily solved by changing the V3 to V2 inside the URL. Just use the /V2/northwind/northwind.svc as the service URL and you can solve this problem. 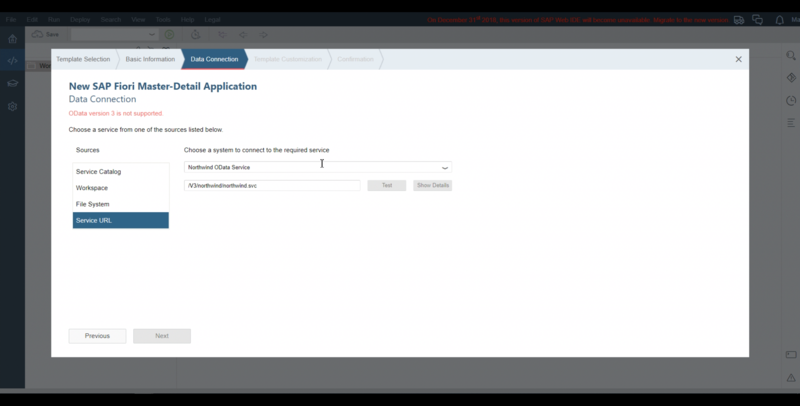 But if you are trying to do the same steps in WEB IDE with a trial account you will see that you cannot run the application and you will see cross reference error in console, while the first explained steps regarding establishing a connection in SAP cockpit was for conquering the cross reference problem. Look at the following video for more evidence regarding the error. It took some days of mine to find a solution for this problem, so I thought mostly many other peoples also could find my solution useful. The reason for this cross reference error is that WEB IDE in its trial version for any reason that I don’t know does not support batch requests, and after failure on batch request it tries to connect to NorthWind directly. Mostly it is a bug in WEB IDE Trial version or maybe somehow some limitations, but I’m not sure about that. By adding the following block of code to the default model we prevent using batch for that model and you have to be able to run the application without any error like the following figure. I explained these steps as I am going to use the result of this post in my next posts, hope you like it and follow my posts. Isn’t this a xcsrf problem because $batch does a POST and a POST opposed to a GET needs the xcsrf token? Actually I am not sure. The only thing that I am sure you cannot do any batch request on the trial version of WEB IDE, while you can do on paid version. It is xcsrf problem and it is not. It seems in the WEB IDE when it cannot access the data via the bridge connector that we make to get rid of xcsrf problem, it tries to access the resource directly while it must not. We make a connection in cockpit to get rid of xcsrf but as batch is not possible in trial version of WEB IDE, it tries to access the external address directly and this is the point that we see xcsrf error in the console. Hi MJZ Soft – you are misleading. There’s no bug in Web IDE Trial, it’s the OData service (in this case Northwind) that does not support the batch operation. As you can see, the blog you’re referring to is very old (4 years ago), so the best thing to do is to ask the original author of the blog to update it (cc: SIMMACO FERRIERO ). I wouldn’t expect a 4 years-old blog to work seamlessly today. Things are changing. I see you’re still using the “old” Web IDE from looking at your video, this will be removed at the end of 2018, so if you want to publish an updated blog, I would use “Web IDE Full-Stack”. It’s great that you figured out how to overcome the batch issue, and it’s great that you want to share it with the SAP community, however please correct your blog as it creates a false impression. Thanks for your hints. I will try to do my best. But one question, if the North Wind does not support batch how does it works in paid WEB IDE perfectly? Just open the picture in another tab to be able to read its details. The content of the blog is correct and valid yet. The only thing which is not valid is the version 2 of the OData that we must use. That is not the main discussion of this post. As Michal Keidar has pointed out, the blog post you were referring to is not maintained and still uses the insecure protocol http:// for the destination URL. Since the domain odata.org has already moved to HTTPS, please update your destination URL as well to https://services.odata.org/. The request for the service metadata can be then proxied successfully even with the useBatch enabled. The UI5 documentation topic Create Northwind Destination also guides how to do it. You can see a working example here: https://odatav2northwind-p1941744473trial.dispatcher.hanatrial.ondemand.com/index.html. You just saved an entire step in my exercise for TechEd! Now my attendees will not have to add “useBatch”:false in their app’s manifest.json. I assumed the service does not support it because I kept getting this “not implemented” error. So thanks for the clarification! BTW, during the the upgrading, there is no property of “TrustAll” in SCP Destination Configuration. what you need to do is just replace ‘http’ by ‘https’.